We are the Black Powder group here at WWCCA and we’d like to welcome you to the Club. We encourage you to attend the various meetings and get involved in all the activities available here at the club. Get to know people and ask questions. That’s the best way to navigate around and enjoy the place. If you don’t feel comfortable participating yet, then just come out and watch how things are done. Eventually you will get to know people and realize we’re all here for one main purpose…to have fun!!! Our particular group, the Tonquish Muzzlerloaders of WWCCA, have our monthly meetings on the second Thursday of each month, at 7:30 p.m. Open to members you are encouraged to come out and introduce yourself. We are very eager to share our hobby with anyone who may be curious, so come on by! Our shoots consist of a monthly “walkthru” which is a variety of targets we’ve set up in the woods beyond the wall along the 200 yard range. The entrance to the walkthru is at the very southeast corner of the 200 yard range parking area. There is a sign marking the entrance. These walkthru’s are usually the first Sunday of every month, depending on our event schedule for that month, and usually at 10:00 a.m. However, read your “Clubhouse Window” to make sure as these dates change on occasion depending on our schedule. We also shoot sometimes on Saturdays and Wednesdays. We hold to major Rendezvous’ every year here at the Club. 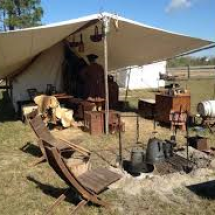 The big one is the annual “Labor Day Weekend Rendezvous”, which is the largest primitive Rendezvous held in the state of Michigan. The other one is “The Wintering” held on the last full weekend of January. A much smaller affair but every bit as enjoyable as the other. We sometimes have a small campout on Memorial Day weekend, and sometimes also on the July 4th weekend, and these are very relaxing events as well. Our Chairman is Greg “Shortcut” Baack. His phone number is on page 2 of your Clubhouse Window newsletter. We also have an event coordinator of Blackpowder activities and her name is Roxanna “Style-n-Grace” Maddox. Her number is also on page 2. See below to see what it is that we do!!! During the fur trade of the early 1800’s the person leading a party of trappers was called the Booshway. The term comes from the French word “bourgeois” meaning middle class and was used by the voyageurs. The mountain men of the west heard it and simply changed the pronunciation to suit themselves. In modern buckskinning the term Booshway is given to the person in charge. It is a sign of respect. When I think of Leonard Darnell one way I think of him is as Booshway. It is a position he held with the Tonquish Creek Muzzleloaders for years. But it is a position that he held amongst his friends for as long as they called him friend. Leonard was a natural born leader. No one that called him friend would disagree with that statement. Many of you know him. Some of you might not realize you do. Leonard was at many work days and events. He served several terms as a Board member. He attended most monthly meetings of the club. He spoke often at the meetings. He was prone to make good points in the debate. When his advice was followed things generally went well. You might have taken note of him when he shared his membership number: 29. Yes, Leonard had a long history with this club. His parents, Joe and Pauline Darnell were early club members. They primarily shot shotguns. They joined when the club was located on what is now the Holiday Nature Preserve. Back then the club was best known for archery and Leonard participated. He and his siblings also worked as pullers. His sister, Loraine Malloy was also a member for many years, shooting shotgun and is still working with youth shotgun programs. Loraine’s son, Todd Malloy, also a shotgun shooter and Leonard’s daughter, Liz (now Considine), worked as pullers when they were younger. I suspect most of you remember him as a skinner. 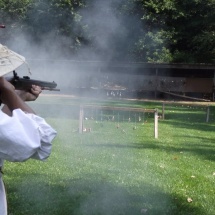 Working and playing with the black powder shooters. That long relationship began in 1979 when Leonard’s father gave him for Christmas a 50 caliber Hawken. 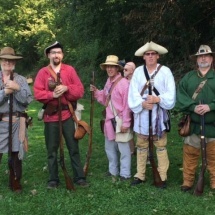 Leonard soon after joined the newly formed black powder group. Both Liz and her sister Chris (now O’Meara) would camp and shoot with the skinners. Now a fourth generation of the Darnell family is involved with the club. Two of his grandchildren, Ben Sluder grew up camping with the skinners and Sean O’Meara is an aspiring shotgun shooter. As I said, Leonard was a respected leader. One of the reasons why was his type of leadership. He was what is called a servant leader. By that I mean that deep down inside he was a servant first, and that simple fact is the key to his greatness. At least in my eyes. I expect there are others in the club that knew him and get what I mean by that. Servant leadership is not about being servile, it is about wanting to help others. And that was Leonard, the WWCCA leader, down to the core. He was not going to do it for you but he would be with you every inch of the way and show you how to do it. He believed that everyone brought something to the table, it was just a matter of figuring out what it was. Sometimes mistaken as the same, servant leadership is not the same as “lead by example”. Leonard did that too. He never asked any of us to do anything at the club that he was not willing to do himself and most of the time he was right there working with us while we did it. Friends remember that he had an engaging personality, and they believe that everyone who knew him was the better for it. Many in the Tonquish Creek Muzzleloaders benefitted from his servant leadership and have their stories to tell. These are just some of the occasions I witnessed the servant leader at work. When I came to WWCCA I owned a 50 Caliber Hawken made by Thompson Center. I had never shot it. I called Leonard on the phone. We set a time to meet. At the first target I expected him to demonstrate what to do. But that was not his way. He carefully and patiently instructed me how to do it. Step by step. Then he had me shoot at the target. Then he loaded his rifle and shot it. We moved to the next target. Same routine. While we walked and shot he kept me entertained with that powerful gift of gab he had. And in case you were wondering he discreetly kept an eye on all I was doing and would gently remind me when necessary and congratulate me when I had done something well. Years later I can remember a time when a member had acquired his first flintlock. He asked Leonard to teach him how to shoot it. Same routine. But now a half dozen other skinners were present for the training. After the new rifle owner had missed a half dozen shots Leonard was puzzled. He knew that the shooter never hit them all but the shooter never missed them all either. Leonard asked if he could shoot the rifle. He then loaded, primed, aimed and hit the target. Dead center. With that smile of his he handed the rifle back and said “it’s not the rifle son”. We all cracked up. We knew Leonard was simply providing the new owner of the flintlock the confidence that his flintlock could do the job provided he was willing to put the practice in. When we began the Thursday night rifle building class Leonard asked how many students had signed up. I told him. At the first class Leonard showed up with a hand built gun vise for each of the students. It was his gift and his way of encouraging us in our endeavor. Those that received them still use them today. And when my son wanted to build a rifle I used Leonard’s vise as a model and built a vise for him. When I told Leonard about that he was very pleased to see his knowledge passing down another generation. I know of a time where a skinner asked Leonard to help him make a pair of buckskin britches. 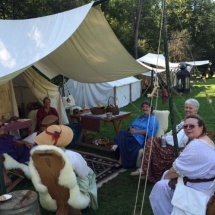 As they were at the Kalamazoo Living History Show it began with Leonard taking the skinner over to the leather seller for some old fashion horse trading and the acquisition of the necessary leather. Then they agreed on a Saturday morning that the skinner would come over to Leonard’s house where he walked him through the process step by step. When the skinner was working on steps that took time Leonard simply picked up something he had been working on and busied himself until his student was ready for the next step. Again regaling the student with his stories as the day went on. I had a similar experience when I asked for help carving a heart pendant out of antler for my wife. I arrived early Saturday morning prepared to go as far as I could before he stopped the teaching and sent me home. I did not realize he had committed the whole day to me and another skinner working on a different project. He instructed the both of us and while we worked he busied himself with his own tasks. When I had finished the carving he asked if I had the material for making the necklace part and when I said no he pulled the pieces needed out of his drawers and showed me how to do that. I offered but he would take nothing for the parts. They were his gift. I have heard numerous stories about his generosity. I was also pleasantly surprised that about dinner time I had finished the project. Always thinking about the welfare of the people he was with he had Gloria, the love of his life, put dinner together for us. We ate and talked for several hours. Leonard shared his time, his materials and his teaching regularly over the years with many members of the club. That was just how Leonard rolled. It was Leonard that took a young pilgrim (a man new to the life of a trapper) like Greg Baack and showed him how to lead the black powder shooters. Greg is Booshway now and has been for some time. And Greg learned the lessons well because he leads the same way. First he serves. I am sure Leonard would say: “you’ve done well pilgrim”. You may have picked up on how I have been talking about Leonard in the past tense. That’s because on Sunday, February 24, Leonard succumbed to the cancer he fought for many years. He did not want a big funeral or any sort of fuss made over him. So next time you have a moment with your friends at WWCCA raise a glass in remembrance of him. But if you really want to honor him, step up and do something for the people in the club you hang out with, your discipline or for the club itself. Be that servant leader and give some of you to them. Your friends will benefit from the gift. The club will be better off for it. But most importantly you will find that you will be a better person for having done so. In the Spirit of Leonard – be a servant leader. Why not start the next time you are at the club. Now Leonard would think my article was a smokepole without Dupont (rifle without powder) if I failed to notify the readers what we are doing in the month of April so here goes… Our monthly walk thru is April 7 at 10 am. Meet at the 200 yard range parking lot. Our monthly meeting is April 11, 7:30 pm at the blacksmith shop. Our weekly gun building classes are Thursday nights at 7:00 pm also at the blacksmith shop. And we are hosting the Good Friday Fish Fry on April 19. Please come out, say hi, and dine with us. Lastly, here is one just for the skinners in the club, it comes without green hand explanations: WAGH! Lock, stock and barrel that Fire Starter had the hair of the bear, he did, and the Shining Mountains is a whole lot worse off on account of his having gone under! It will be poor bull for a moon or two and that’s for certain. Take peace in knowing that Leonard is on his own hook now.